Go Green Week - What is happening? Find out what activities are planned for Go Green Week across UK and Ireland. 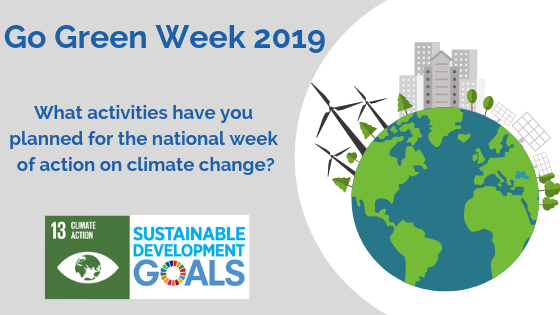 This week (11th-15th February 2019) is Go Green Week and we are celebrating all of the initiatives being held to raise awareness of sustainability across the UK and Ireland. Aston University, University College Birmingham, Birmingham City University and Birmingham Metropolitan College, supported by several other local organisations and charities. During the week of 18-22 March 2019, local universities and colleges in Birmingham city centre are coming together for the first time, to host a city-wide Green Week, ‘Brum Goes Green Together’. The week of sustainability themed events is the result of months of planning which first began early in summer 2018. As well as each institution planning their own ‘on-campus’ activities, there will be two larger joint events. On Tuesday 19th March, staff and students from the different Universities and Colleges will take part in a joint canal litter pick. The Canal & River Trust will be providing a boat to collect all the rubbish and the volunteers will gradually make their way along different sections of the canal to the final meeting point where they will come together for a big team photo! The second joint event is the ‘Brum Goes Waste Free’ day on Wednesday 20th March. UCB staff and students will be giving cooking demonstrations and handing out free meals to members of the community in Victoria Square in the city centre. These meals will be made from ‘wonky vegetables’ donated by local supermarkets and food waste charities. There will also be a number of organisations and charities demonstrating their waste reduction and packaging free solutions. As well as these two days, a ‘sustainable travel roadshow’ will be making its way to each campus on a separate day of the week, offering incentives and providing information on the different local transport options available to staff and students. The college is celebrating Go Green Week with free bike mends from Dr Bike, a fim screening of ‘Do the math’, a community litter pick and much more! You can also see their programme here. Queen's 2019 Green Week has a whole host of events being held – from a tour of a tour of the Tropical Ravine in the Botanic Gardens to cookery demonstrations, Green film nights to workshops that show how to make a bird feeder. They have so much planned! The university celebrates this week to educate and inspire students and staff to take action on environmental issues such as climate change and plastic pollution. They have a huge programme of activities, including a quiz, yoga and a sustainability booth. A celebration of Go Green Week and Volunteering Week is happening in Leicester this week. They have organised a whole host of activities, including giveaways, a zero waste shop and a marrow donor drive. Kingston University is hosting one of a regular series of Go Cycle events in partnership with the Royal Borough of Kingston (at the Penrhyn Road campus). This includes a ‘Dr Bike’ check, Bike Marking and Go Cycle information including promotion of Love to Ride membership and of the Mayor of London and Transport for London Mini-Holland £30 million investment which has seen a new pedestrian/cycle friendly plaza outside Kingston train station and new cycle paths.